Here's a really cute gift idea. 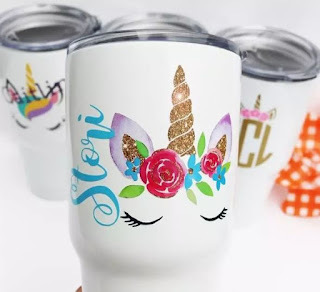 These Monogram Unicorn Decals ONLY $5.99 (Retail $16.99). Design it! Personalize it! Decals are all the rage. Customize with a name of your choice and your favorite Unicorn arrangement'. A great deal for anyone! All decals will come with application instructions for easy application! This is a vinyl sticker....DOES NOT INCLUDE A CUP. $1.99 for the first item and $0.29 for each additional item. US only. Ships no later than Fri, Jun 8.